Indie games have definitely made their presence known within the last decade. Tons of small development teams have put out fun experiences. They do not cost a lot to make or buy and they give a good time. 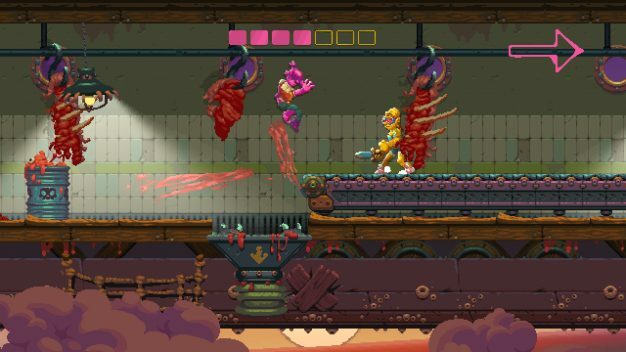 Nidhogg 2 is a game that takes that idea and tries to get the most out of the very little that is available. While I had never touched the first Nidhogg game before, I had watched videos on it in the past. The sequel does not change up much at all from the first game. 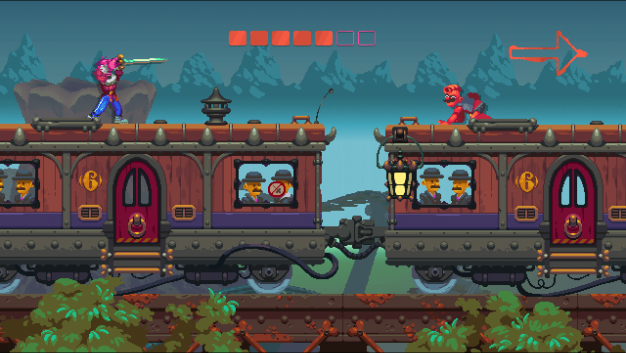 Nidhogg 2 is a simple game. It is a 1v1 fencing battle to get past your opponent to the end of the map, where you offer yourself up for sacrifice to the giant wurm. The game plays out like a tug-of-war in that once a player is defeated, the victor of the battle runs forward. Once the dying player respawns though, they have a chance to kill the other person to make up lost ground. The 1v1 battle style is the only mode available to play. The arcade puts the player up against an AI that never gets tougher on 10 different maps. While they sometimes can put up a fight, when you find their weakness, you can spam it until you win. For example, I had a lot of success running towards the AI and jumping over them. They never accounted for a jump, and when I was past them all I had to do was dodge the item they were throwing at me. Single player is not where this game shines, but it seems like a decent place to get some easy practice in if you want to hone your skills. Local multiplayer is where the first Nidhogg made a name for itself. Having a second person to play with makes the experience much better. The insanity that the two pull off against each other and the shouting that ensues is where this game shines. There is also a tournament mode that I unfortunately never had anyone to test out with, but having more people to play with would be a blast I presume. There is an online multiplayer, but as of now I do not recommend it. I never once had a game played with a good connection. Every single one was a laggy mess and completely took any fun out of the game. Should an update come out addressing these issues I would love to give it another try, but as of now, online is not worth your time. The maps are fun and varied. They offer different obstacles to combat the use of spam to win. I cannot say I had a particular favorite, but I wouldn’t say I disliked any either. New weapons are available to use as well. Every time a player spawns they are randomly given a bow, a longsword, or a knife. I did not like that I could not change or choose my weapon at will. The longsword was by far my favorite weapon to use because of its long reach and throwing it was fun. Whenever I had a knife I felt at a disadvantage against the opponent and the bow was only good if the opponent was not coming at you, which is the point of the entire game. One big difference between this and the first game is the graphics. The first game kind of looked like it could run on an Atari system. 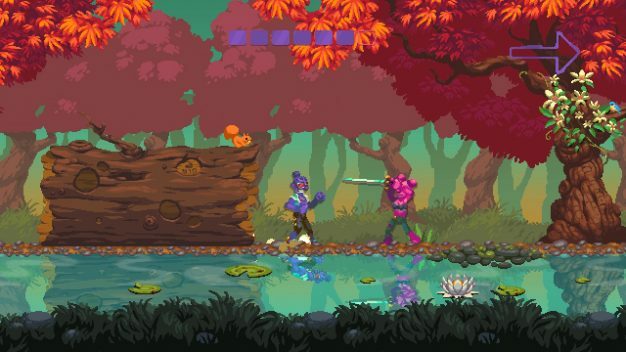 Nidhogg 2 looks much better with the ability to customize your avatar. Nothing really groundbreaking with its design, but I do appreciate the work taken to make it look as good as it does compared to the former game. 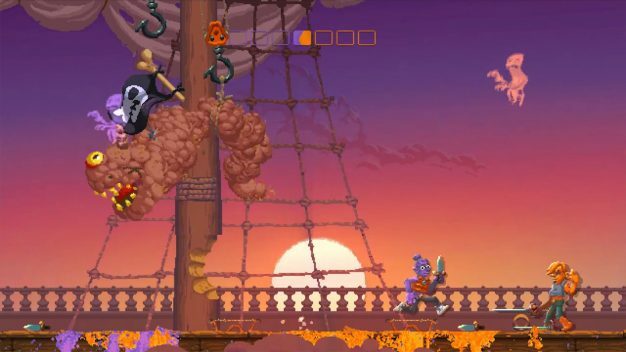 Overall, Nidhogg 2 is a fun game if you have other humans to play with. It’s probably best thought of as a party game as single player is meh and the online is a mess. If you have people to play it with routinely, I would say it is definitely worth the $15 price tag.